Monastery of Barlaam, Meteora, Greece. On Good Friday, Christ died to redeem the sins of mankind on the Cross at Golgotha outside Jerusalem (Matt.27,33-56; Mark 15, 22-41; Luke 23, 33-49; John 19, 17-30). This composition shows Christ on the Cross on top of a hill with the Virgin and St. John the Divine at the sides facing him. Other figures present are the Holy Women behind the Virgin Mary and the Centurion Longinus behind. St. John, (raising his right arm towards the cross in Orthodox tradition, the officer in charge of the guard at the Crucifixion). 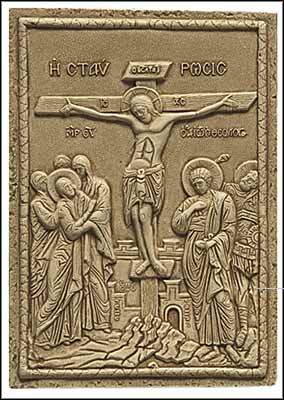 The crucified Christ, dressed in a loincloth, with head sunk down, body bowed and blood flowing from his wounds, occupies the upper part of the icon. The skull inside the hill is that of Adam. The walls and towers of Jerusalem rise in the background.